What’s the difference between fat burning and high intensity cardio and is one better than the other? Fat Burning Cardio is exercise performed at a low intensity for a longer duration, such as walking, a slow jog or riding a bike at an easy pace. This easy pace translates to 50 – 55% of your Max heart rate. Another way to measure this would be your perceived rate of exertion. Try this easy technique: if you can carry on a conversation without losing your breath while performing the exercise, you are most likely in a low/fat burning range. If you’re wanting to burn fat and you’re new to the whole exercising concept, this would be a good place to start. It’s estimated that 50% of the calories burned in a fat burning routine come from fat. The catch is that you have to perform the exercise for a longer duration to burn the same number of calories burned during a high intensity workout of a lesser duration. Suggestions are 45 – 60 minutes at a slow steady pace. Moderate Intensity Cardio would be performed at 60-70% of Max HR, for 30-45 minutes. 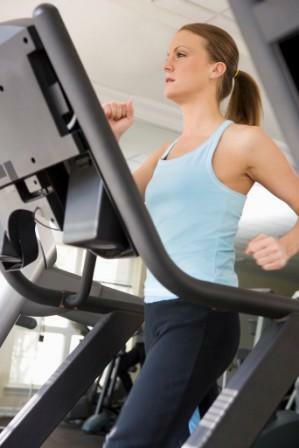 High Intensity Cardio is performed at a higher intensity rate for a shorter duration. Examples are running on the track/treadmill or sprints on a bike. The key is to get your heart rate up into the high cardio zone which is 75-85% of your Max HR. Since you’re working at a higher intensity level, it will take less time to burn the same number of calories as it would if you were performing a fat burning routine instead. So you’re thinking fat burning routines will help you burn more fat as fuel because 50% of the calories will come from fat. Well, if you look at the duration and total number of calories burned and factor in the percentage of calories burned as fat during a high intensity cardio routine (40%), you will see that the high intensity routine will bring you better results over time. The recommended time for sustained high intensity is 20 minutes. So it’s a shorter workout to burn more calories, but it’s a higher intensity that some individuals may not want to sustain for 20 minutes. The Middle Road: Interval Training allows you to go longer than pure high intensity alone. It’s comprised of low/moderate cardio interspersed with short bursts of higher intensity. An example would be using a treadmill starting at a comfortable speed walk for 2 minutes to warm up, then starting intervals such as 1 - 2 minutes of high intensity (running at 75-85% of Max HR) followed by a recovery period of 2 minutes (light jog to bring heart rate back down). The intervals would alternate back and forth for a total of 20-30 minutes. This is your best bet, combining a high total calorie burn with optimal fat burning. How do you calculate your Max Heart Rate and Target Heart Rate zones? Most gyms will display a chart for figuring this out. The most common formula is 220 –age = Max Heart Rate or Max HR. This formula is the easiest to administer, but doesn’t account for deviation. Take your pulse on waking, before you get out of bed, for one full minute at your carotid artery (under the jaw) or radial artery (inside of wrist, below the thumb). This will give you your resting heart rate [RHR]. The resting heart rate for the average person ranges from 60–80 beats per minute and is generally lower in physically fit individuals. Note: do not take heart rate readings at your carotid artery (under your jaw) while exercising as you may put too much pressure on the artery, decreasing blood flow. Stick to your radial artery (at your wrist) for manual readings during exercise.